Assorted filled milk chocolates in miniature form. 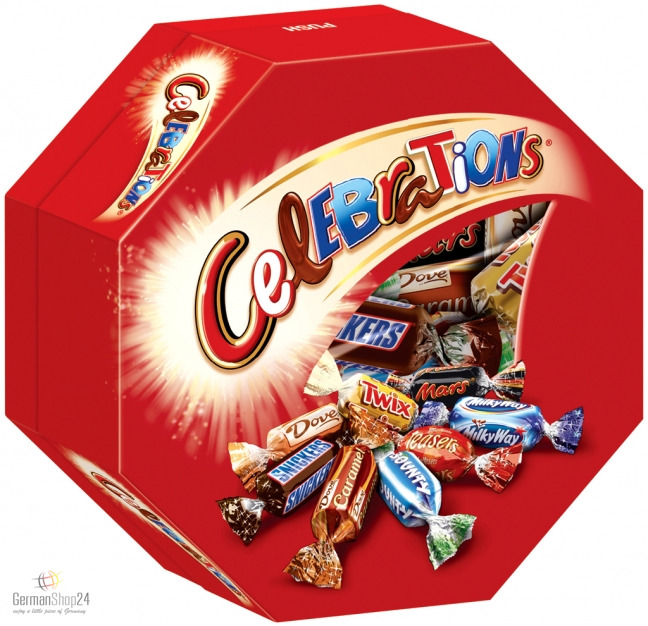 The octagonal packaging is filled with the eight classics of the company Mars. 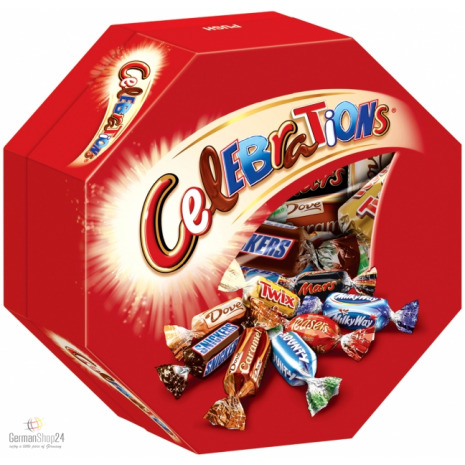 Celebrations® is a colorful blend of the best brands of the MARS GmbH in mini praline format and excellent for sharing with friends or when visiting your loved ones. With the eight classics united in a noble, octagonal packaging everyone will find something for its taste. A must-have for any occasion. Store dry and protect from heat! 190g / 6.70 oz NET. WT. Sugar, glucose syrup, cocoa butter, SKIMMED MILK POWDER, cocoa mass, BUTTERFAT (from MILK), LACTOSE, WHEAT FLOUR, palm fat, PEANUTS, grated coconut, SWEET WHEY POWDER (from MILK), palm kernel oil, WHOLE MILK POWDER, sunflower oil, emulsifiers (SOY LECITHIN, mono- and diglycerides of fatty acids), BARLEY MALT EXTRACT, fat-reduced cocoa, salt, humectant (glycerol), HEN'S DRIED EGG WHITE, natural vanilla extract, raising agents (calcium phosphates, sodium carbonates, potassium carbonates), WHEAT GLUTEN, MILK PROTEIN. Cocoa: at least 25%. May contain traces of hazelnuts, almonds and oats. Zucker, Glukosesirup, Kakaobutter, MAGERMILCHPULVER, Kakaomasse, BUTTERREINFETT (aus MILCH), MILCHZUCKER, WEIZENMEHL, Palmfett, ERDNÜSSE, Kokosraspel, SÜSSMOLKENPULVER (aus MILCH), Palmkernöl, VOLLMILCHPULVER, Sonnenblumenöl, Emulgatoren (SOJALECITHIN, E471), GERSTENMALZEXTRAKT, fettarmer Kakao, Salz, Feuchthaltemittel (Glycerin), HÜHNEREI-TROCKENEIWEISS, natürlicher Vanilleextrakt, Backtriebmittel (E341, E500, E501), WEIZENKLEBER, MILCHEIWEISS. Kakao: 25% mindestens. Kann Spuren von Haselnüssen, Mandeln und Hafer enthalten.